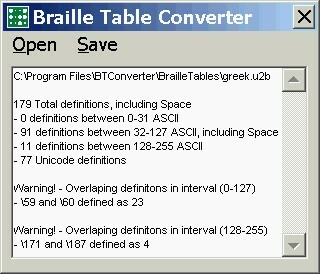 BTConverter is a software application, developed and offered free by BAUM Engineering, in order to convert files into most popular Braille Tables formats: bt, u2b, b2u, jbt. In addition, the application checks the most important criteria of validity of Braille tables and report possible errors. You can download the application from here.